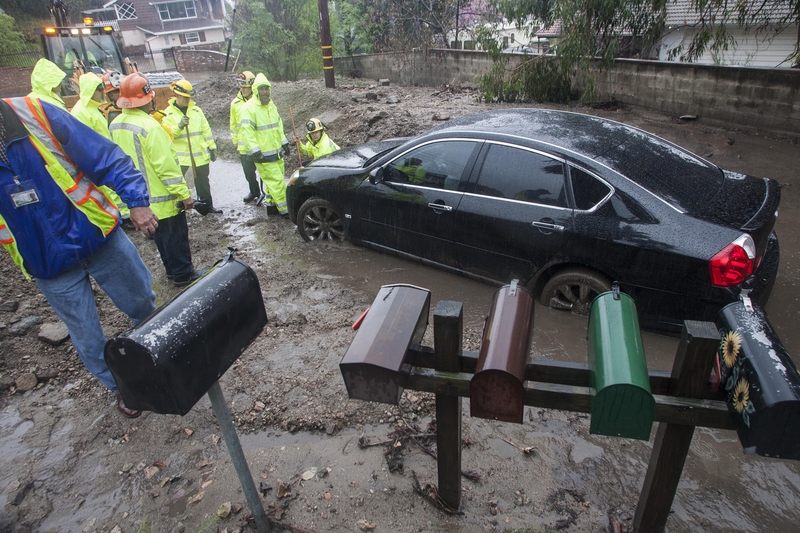 This car was stuck in mud up to its axles Friday after a mudslide in Glendora, Calif. Critically needed rain has given the state some relief but some problems as well. LOS ANGELES – It’s not quite a month of Sundays – or even a perfect game pitched in the seventh game of a World Series – but something rather extraordinary happened across California on Friday. Sheets of rain swept across this state pocked with depleted reservoirs, fallow fields and brown hills, providing at the very least a respite from what meteorologists have described as the worst drought Southern California has endured in more than 100 years. The Friday storm, which was expected to stretch into the weekend, followed a shorter storm Wednesday, a back-to-back soaking that forecasters said would produce as much as 10 inches of rain in some parts of the state and heavy snow in the Sierra Nevada. More rain fell here in Los Angeles over the course of 12 hours Friday – 1.53 inches – than had fallen over the last eight months, according to the National Weather Service. The onslaught brought cheers from farmers fearing economic catastrophe, rural communities whose water supplies are projected to run dry within the next two months and people across the state dealing with water conservation restrictions imposed by state and local governments. But as California headed into the third year of a historically bad drought, officials said the rain, as welcome as it was, would not rescue the state from its plight. “This won’t take us out of the drought, but it definitely helps,” said Kathy Hoxsie of the National Weather Service. Tim Quinn, executive director of the Association of California Water Agencies, said the state’s water supply was just 44 percent of average, adding that he thought it highly improbable that the state would reach its normal water supplies before the end of the rainy season in April. And the rain itself brought complications for a region that, even during normal times, is not accustomed to this kind of weather. Because the ground is so dry in the region, it is also less able to absorb water. Flash flood warnings were issued in Los Angeles County, and roads were closed as waters rose. Power was reported out in regions across the state because of fallen trees. Mandatory evacuations were ordered for more than 1,000 homes in Glendora and Azusa, east of Los Angeles, where a wildfire scorched the hillside in January, leaving the communities vulnerable to mudslides because the vegetation that helps hold the earth in place had been burned. Power was out in the area, and before leaving, residents on the hillside packed sandbags in front of their doors, hoping to keep out any water and debris that might flow downhill. At least 57 flights were canceled at San Francisco International Airport. Road flooding was reported in San Francisco and Los Angeles, and authorities were closing roads – some of which had turned into muddy rivers – across the region.